Mattel Jumbo Machinders - the Shogun Warriors! 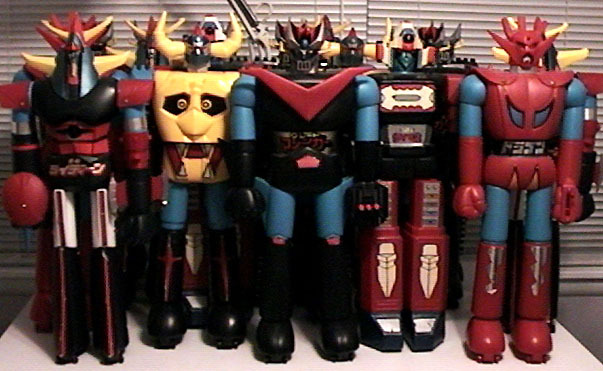 Mattel introduced the Jumbo Machinder concept to the world with the debut of the Shogun Warriors in 1977. The most common Shogun Warriors were 23 1/2" tall plastic warriors that fired projectiles from their hands, chest or legs. Many also had cool weapons and/or fists that shot off via spring mechanism. Marukai Trading Company had exclusive rights to import the Shoguns to the US via Oriental grocers and video stores (most of these seem to be found in Hawaii or California), why some Japanese boxed versions (like the bow fisted Raideen) are remembered (and sometimes found). 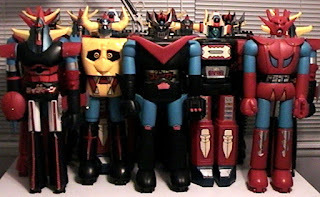 The initial Mattel release featured three Shogun Warriors: Mazinga (Mazinger in Japan), Raydeen (Brave Raideen), and Dragun (Getter Robo G, Dragun configuration). There were at least three very different releases/versions of the initial three Shoguns during the toys run (Mazinga became Great Mazinga towards the end). Later Godzilla, Gaiking, Daimos and Rodan were released, Rodan as one of the "World's Greatest Monsters" instead of under the Shogun title. There were also some foreign release Shoguns: Goldorak (Grandizer or Goldrake.) in a French/European language box, as well as some variations to construction of figures (for instance, in some markets the Mattel Mazinga was released as Mazinger "Z" in a strange mashup of Mazinga and Goldorak. Click here for the French sticker!). There are also dual-language versions (English and French) that were marketed in Canada. All of the Shogun's were originally released in Japan in varying formats (The 24" Poseidon is very cool, and the Cargosaur made to fit the Popy Jumbo Machinder line is incredible), some that were exclusive to Japan command prices in the thousands when found mint and boxed (due to rarity). Also, many alternate fists, shooters and accessories were sold in Japan to compliment the Shogun line (Raideen's "Iron Cutter" or shooting axe fist was actually a Mazinger Z accessory). Look up the Popy list under the same menu for more information and images. To round out the large figure format, Mattel released a battery operated Gaiking re-titled Zargon (renamed probably to avoid confusion).